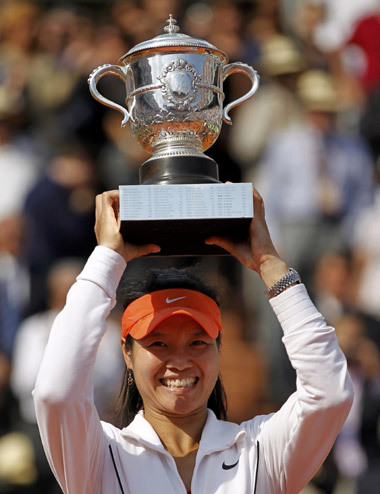 Fan Wentao's mobile phone started ringing as soon as Li Na dispatched Francesca Schiavone at the French Open to become China's first Grand Slam tennis champion. The historic victory has resulted in a surge of interest among children in the sport. "Parents say that their children are now really interested in tennis and they want them to play," said Fan, a tennis coach in Jiujiang, Jiangxi province. "It's unbelievable." There is no doubt that Li's historic win on Saturday, and the media coverage in China, have created a tennis craze throughout the country, especially among youngsters who can see themselves emulating Li. "Most of the parents who called said their children had never seen a tennis match until the French Open final was shown on national TV," Fan said. The champion's prize money of 1.2 million euros ($1.7 million, 11.37 million yuan) also surprised many of them, he said. More than 116 million Chinese people watched the live broadcast of the women's final. Song Nanxi, who is 13 and one of Fan's students, said Li's triumph made her extremely proud. Song and her partner won the Jiangxi junior doubles title last year. "My classmates knew little about tennis and didn't think it was as cool as basketball," she said. "They always talk about (NBA player) Yao Ming, but no one knew about my idol, Maria Sharapova (Russian tennis player), or was impressed by my titles. "Now they are not only proud of Li, who is my new role model, but some even ask me to teach them how to hit the ball like her, which made me very popular." Song started training under Fan when she was 7, and she said that what she loves most about tennis is the joy and fun it brings her. Fan, 42 and a coach with the Jiujiang Sports Bureau, played professionally on the Jiangxi tennis team. Now he has more than 30 students ages 5 to 13 who have two-hour practice sessions after school five days a week. The bureau keeps an eye out for a young talent through such programs. "Li's winning could inspire so many young people and, more important, their parents," Fan said. Some parents he had approached in the past refused to let their talented children play tennis because they didn't believe Chinese could go anywhere on the global stage. 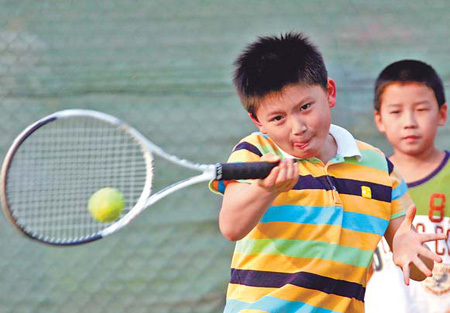 When Fan started to teach children tennis in 1998, there was not one tennis court in Jiujiang. His students were trained on a concrete basketball court. Now many schools have standard tennis courts, and the sport can be introduced to students at a young age. He said his students rarely have opportunities to play outside Jiangxi, but young players need to play in tournaments so they can improve. That requires sponsorships, and Fan said he hoped companies would contribute to cover the expenses for his students to play outside the province. Fan said he has been trying to be a Western-style coach because he believes it's better for young players' long-term development. "Chinese coaches often emphasize improving young players' techniques so they can physically play well, while foreign coaches believe attitude is more important," he said. "Li succeeded as an individual because she mastered both." In Tianjin, hometown of Peng Shuai, who made it to the third round of women's singles at this year's French Open, parents have become more willing and able to support their children's tennis, said Tang Jiaying, vice-director of the Tianjin Tennis Sport Management Center. The city owns eight professional sports schools teaching tennis to talented children under 10. Each school has 20 to 40 students, who compete in a citywide tournament for a spot on the Tianjin Tennis Team. "Training young players is a long process and requires more than good technique to succeed," Tang said. "They need to have developed senses, such as the sense of attack, which can only be learned from playing matches, as well as having good coaches and even studying abroad." If good 14-year-old players aren't nourished in that way, Tang said, they may drop out at 17. To encourage young players to play more games abroad when they qualify, the center pays for the round-trip air tickets while the player's family takes on the cost of accommodations.